If I had to sum up Great Battles in History by Mark Shyzer at the Toronto Fringe Festival in one word, I would call it an experience. 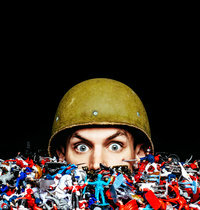 This touching, hilarious, one-man show tells the story of a failed collaborative project that examined great historical battles from a futuristic perspective. Without giving much away, the story of the steadily declining production crew coupled with historical tidbits about past warlords reveals the significance of individual losses. Shyzer is charming, funny, and just off-the-cuff enough to make even the toughest audience member—myself–respond. He worked the room easily and effortlessly. At nearly every turn were tons of side jokes that were insightful and downright hilarious. Everything in Great Battles in History functioned to make the play complete while also looking like a work in progress. Which brings me to one of my favourite parts of the entire production: the technology. Relying on slide projectors, a music stand, a book light, and a lamp, Great Battles in History is an ambitious production that embraces the live-theatre experience. Never have I seen a set better-designed to develop both Shyzer’s character and the plot. Each awkward stumble across a dangerously dark stage, or inadvertent wrong slide functioned in the context of the story. He even managed to create sunsets and chlorine glass clouds using water, a slide projector, and Kool-aid. It was beautiful to watch. I didn’t want to look away because there was always something new to see. There is so much to like about Great Battles in History that I was actually disappointed at the end of the play. Considering how many boundaries Shyzer is willing to test, I thought the emotional climax was a bit of a let down. Speaking, too, of Shyzer’s boundaries, there is one warning about Great Battles in History. Part of the play is interested in the guilty pleasure of tasteless jokes and some of Shyzer’s jokes do push the boundaries considerably. Being forewarned in this case is forearmed. Personally, I think these are small criticisms for a show I would love to experience again. There is so much to enjoy that I actually walked out of the theatre sorry it was over. In my opinion, Shyzer can consider Great Battles in History a victory. Great Battles in History plays at the Theatre Passe Muraille Backspace. (16 Ryerson Ave, at the corner of Wolseley).